Welcome 2018 and Happy New Year to everyone. It is that time again when I reflect back on 2017 and pick some of my favorite photographs again. If you visited my website before you have probably seen one of them. Due to work, I have not done any overseas trip (apart from visiting my home country) so there are no photographs from exotic places this year. Well, for some of you Australia and Slovakia may be exotic enough. Anyway, without further ado, here are my top ten 10 photographs of 2017. This photograph just had to be in the selection. My Caravaggio masterpiece with camera, lens and natural light :) It is possible to create an pleasing photograph even in harsh afternoon light. Just look for some trees and dappled lighting. 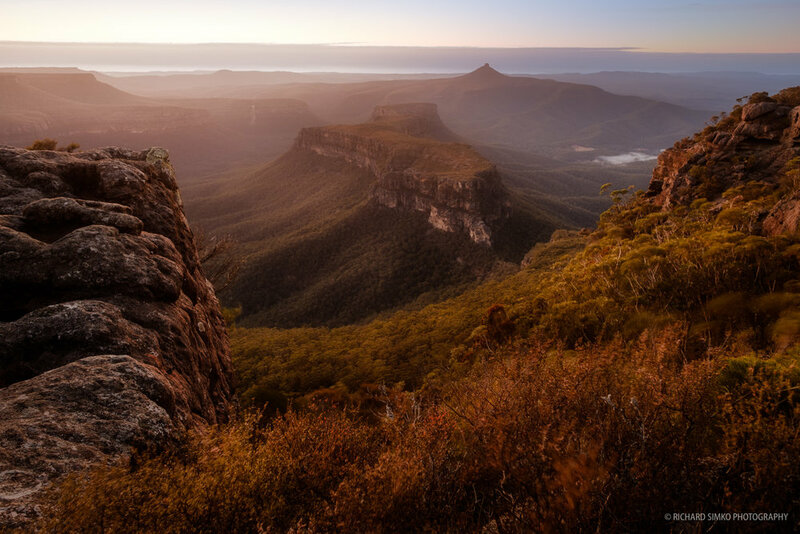 This stitched panorama was taken from Eagle Rock in Royal National Park south of Sydney. The two stream waterfall ads lots of drama to already dramatic sea. Shame the water levels in the river were low. It was a nice experience and evening of shooting nevertheless. Wallaby stare-down. They are quite common in Ku-ring-gai National Park camping ground. They are fairy easy to photograph as they are used to presence of the human. Not everybody is willing to wake up early and get the shot with nice morning golden glow. I am not entirely sure what is the deal with the ears? Results of some famili fight? I got myself an Nikon to Fuji X adapter and took my only Nikkor lens that I have for a spin. 50mm 1.4 nifty-fifty works well on a Fujifilm camera. I got to this place just in time for Harbour Bridge cast shadow on the Opera House. I thought is a natural Vivid Sydney but then again, the photograph worked much better in Black and Whine. Lola and Xara, our two dogs back home in Slovakia have good life. The backyard and the big garden is there for them to run around, play and quite often be very naughty. Especial Xara, who is still a puppy. She often picks on Lola until she boils over and shows Xara who is the boss. Ultimately, they get along very well and live their very happy dog life. Xara guarding the door. I was having a lunch or coffee, I am not sure now. We have quite dense wild grape in the backyard and in the small opening in the foliage I noticed Xara. 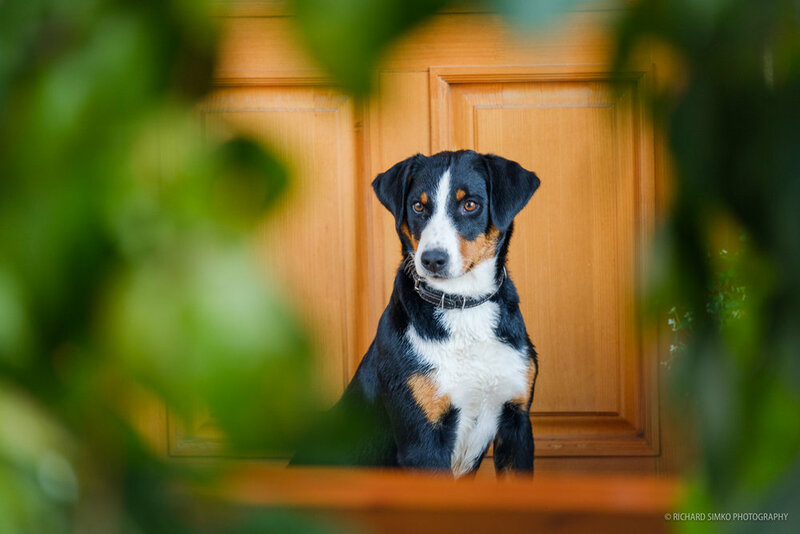 I used the leaves as natural frame and also the reddish wood of the door makes a perfect color contrast with Xara's black/white/yellow fur. She looks quite serious on this one, a stark opposite to her "true personality". We had a small reunion with my former colleagues and friends back home in Slovakia. My friend Mia came with her daughter and we went to my other friend Martin's photo studio. I noticed a potential for a good photo when little girl sat next to piano. Room was quite dark so I opened the aperture and set the ISO quite high. I think the photo came out great. The Acros film simulation was perfect for this scene and subject. I have been overseas for so long that my own country feels sometimes like an exotic destination to me. During my last stay we visited couple of iconic castle ruins in Slovakia. I took thins photo of my sister in a fairly well preserved room in the Castle of Beckov. Sunset from top of The Castle in Budawang National Park. It was literally a race to catch the light. We climbed the last rope, conquered the last boulder and when we reached the top the sunset was happening in full glory. There was no time to set up. These moments usually don't last too long. There was just enough time for some handheld shots. I braced against the rock as my breath was deep and I was shaking after exhausting climb. The photograph came out quite nice and sharp considering I bracketed the shots and put togeter in Photoshop later.